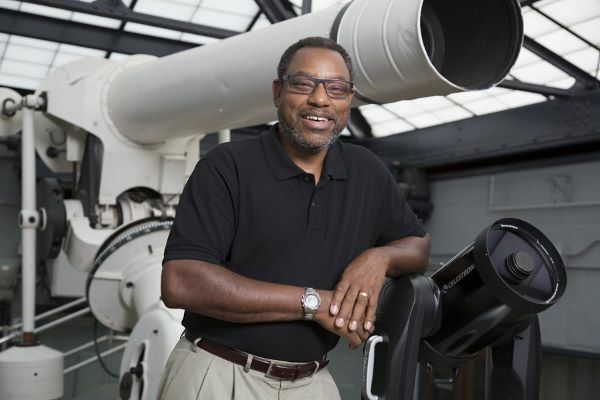 Announcing our 2018-2019 Explorer of the Year, Honorary Dr. Derrick Pitts, Astronomer, “Philly Hero”, and Educator Extraordinaire! Join us as we celebrate our legacy in honoring Derrick Pitts as our 128th Explorer, with a reception, presentation, and (optional) dinner, at the Union League of Philadelphia. Derrick will help us understand our world with his special presentation, ‘Next’, that explores the intersection of imagination, innovation, discovery; their impact on space exploration, and our expanding understanding of the universe. Mr. Pitts, a Philadelphian, embodies the spirit of discovery and exploration that has long sustained the Geographical Society of Philadelphia and it is in his honor that we themed our 2018/2019 season, The World Begins in Philadelphia. In earning our Explorer of the Year title, Derrick Pitts joins such luminaries as Theodore Roosevelt, John Glenn, Diana Nyad, and last year’s honoree, Steve McCurry. For men: Jacket and collared shirt are required at all times. Not Permitted: turtlenecks shirts, collared shirts open more than one button, untucked shirts, jeans, t-shirts, sneakers, and flip-flops. For women: Business suits, tailored pant or skirt ensembles and dresses. Not Permitted: spandex, open midriffs, halter tops, shorts, leggings, extremely short hemlines, jeans, t-shirts, sneakers, and flip-flops.